Riding a bike is like experiencing an adrenaline rush like never before. If you are fond of riding bike or any two wheeler for that matter you must admit that it is a mixed feeling of relaxation, fear, exhilaration and sheer pleasure. Riding motorcycle in India is no different, however, the massive profusion of two wheeler on Indian roads trigger the necessity of protective measures. If you have a two wheeler that you ride on regular basis on crowded roads in India, you must be aware of the dismal condition of Indian roads. Aside from the chance of damage due to poor road conditions, there is also high chance of accident and theft especially in big and congested cities. Hence, it is a good idea to invest in a comprehensive two wheeler insurance in order to remain safe from all these risks. Accidents and thefts are unexpected events and beyond your control. You should, therefore, avail two wheeler insurance online to remain mentally and financially prepared. What does a two-wheeler insurance policy cover? With such extensive protection on offer, you must be thinking about buying two wheeler insurance policy. Now, you have to decide on the right way of availing a bike insurance for your cherished motorcycle. Your best bet is to buy two wheeler insurance online. While brick and mortar insurance offices are still operating across the country to provide bike-owners with motorcycle insurance, there is an upsurge trend of buying two wheeler insurance online. According to some recently published studies, bike owners of all ages are more inclined towards availing two wheeler insurance online. You must be wondering why majority of the folks are opting for online mode. Yes, there are quite a few advantages of buying two wheeler insurance online. You can go through a wealth of information regarding the do's and don'ts of two wheeler insurance on Internet. You can gain information on several different aspects of two wheeler insurance plans such as coverage, features and exclusions to locate a policy that suits your needs. Gone are the days, when you had to visit an array of two wheeler insurers to get quotes to make a comparison. Now, you can resort to portals like GIBL.IN that facilitates buyers with multiple two wheeler insurance policy quotes on a single platform to make hassle-free and fast comparison possible. You no longer have to resort to any insurance agent to buy two wheeler insurance. All two wheeler insurance companies in India now boast a robust online presence and you can buy the policy online directly from the portal. It is even better to buy from portals like GIBL.IN as you will get additional assistance at the time of renewal and claim. The absence of an agent will also reduce the cost of your chosen online two wheeler policy. With the advent of mobile apps , the whole process has become even more effortless. Now you can compare and buy two wheeler insurance from mobile apps while walking on the street. In case you can't understand meaning of intricate insurance terms, or you need help with paperwork or most importantly you need to file a claim on urgent basis , you can get in touch with online insurers at any time of the day by calling or sending emails or messages. You will also be endowed with additional services like policy renewal reminders to help you avoid policy lapse. You can make payments online through debit, credit cards or net banking. Since all transactions are kept on record and online two wheeler insurance providers use secure payment gateways, there is no risk of fraudulent activities. In essence, just like your bike gives you more flexibility on road, online mode will also help you avail your two wheeler insurance cover more conveniently. Buying two wheeler insurance is not an one-time affair. You need to renew your policy every year to keep it valid and effective in time of a mishap. However, now you can opt for two wheeler insurance online and get the whole process done in a few minutes from anywhere and at anytime. Just like the process of buying two wheeler insurance online, the online renewal process will also save your effort, time and money. All you have to do is to renew two wheeler policy online before its expiry. Here some insider tips to reduce your two wheeler insurance costs. While choosing a new plan, you should focus on securing a two wheeler insurance policy that meets your needs precisely. You should steer clear of costly online two wheeler policies that come with extravagant features that you hardly need. You should refrain from making small claims so that you can accumulate NCB to have your premium reduced on renewal. You can consider joining a recognized association or install anti-theft devices in your motorcycle to get discount on your two wheeler insurance premium. If you have bought any add-on cover while availing the new two wheeler insurance you need to reconsider its effectiveness. If you find it unnecessary you can opt it out on renewal and save on your two wheeler insurance costs. Here is a list of top 3 two wheeler insurance companies with lowest premium in India in 2016. The premiums are for a fresh two wheeler policy and are calculated for a 1 seater Hero Honda Splendor Plus bike with cubic capacity of 100cc. The model variant is CAST. The car is registered in the month of February in 2016 in Kolkata. The bike-owner didn’t opt for voluntary deduction or any other type of discount. All the two wheeler policies mentioned don’t offer coverage for accessories as well. The lowest premium for a comprehensive cover is Rs. 1546 and the insurers are Tata AIG, New India Assurance and L&T Insurance. Although, the premiums are same for all three insurers they differ in terms of coverage. L&T Insurance doesn't provide towing reimbursement facility and New India Assurance doesn't offer both free pick-up car and towing reimbursement facilities. However, Tata AIG facilitates bike-owners with both these facilities along with cashless settlement and NCB protection coverage. It is beneficial in many different ways if you decide to avail an online two wheeler insurance policy from GIBL.IN. You can rest assured of getting the best two wheeler insurance deals available in India for buying a fresh policy or renewing an existing one. Here are some of the reasons why GIBL.IN could be your ultimate destination for buying and renewing two wheeler insurance policy. It is an undeniable fact that two wheeler outnumber four wheeler on Indian roads by a long way. The Ministry of Road Transport and Highways data revealed that two-wheeler like bikes and scooters accounted for a whopping 71.8% of the total 141.8 million vehicles in 2011. The sheer abundance of two-wheeler in India well and truly call for adequate protection. Even if your two wheeler is old it still deserves a comprehensive two wheeler insurance policy. Moreover, it is a legal requirement and if you found riding your bike without a valid insurance you could even be penalized. Since bike riding is riskier than driving a car, you should be more cautious. In case you meet an accident while riding your bike and get severely injured or your bike gets badly damaged, your online two wheeler insurance policy will take care of your medical bills and your bike repair costs. With so many benefits of availing a quality two wheeler insurance, there is absolutely no reason why you abstain from buying two wheeler insurance online. 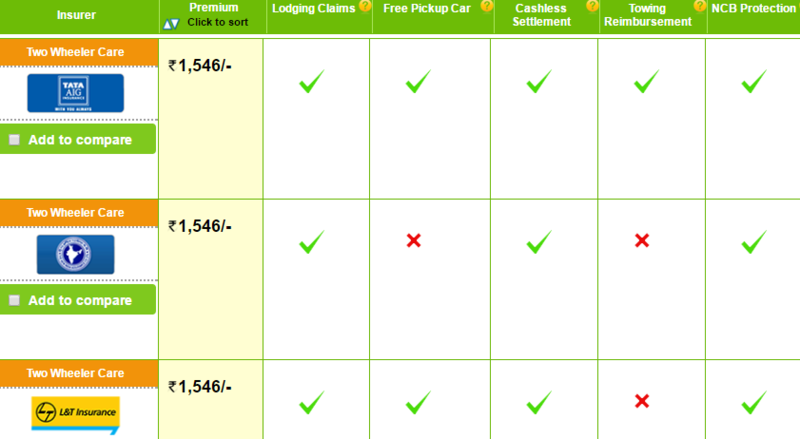 GIBL.IN allows effortless comparison of all available two wheeler insurance policies online. So, when you pick a two wheeler plan you can also buy it on the portal itself. It takes just a few minutes to compare, select, make and payment and buy two wheeler insurance online at GIBL.IN.